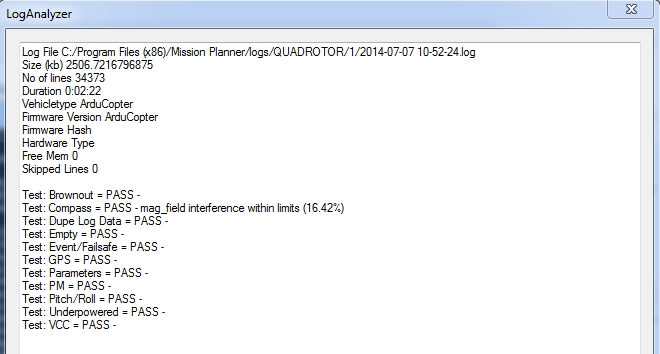 Dataflash logs are stored on the flight controller’s onboard dataflash memory and can be download after a flight. On Plane and Rover dataflash logs are created soon after start-up. On Copter they are created after you first arm the copter. This topic explains how to configure and access Dataflash logs. Telemetry logs (also known as “tlogs”) collect similar information to dataflash logs (see Diagnosing problems using Logs for more information). If your vehicle is having trouble producing dataflash logs - including the infamous “No IO heartbeat” diagnostic message - try a different SD card. You may also choose to test the card using a dedicated tool, such as H2testw. Low board voltates are also known to cause logging issues. Then, select the log you want to download. 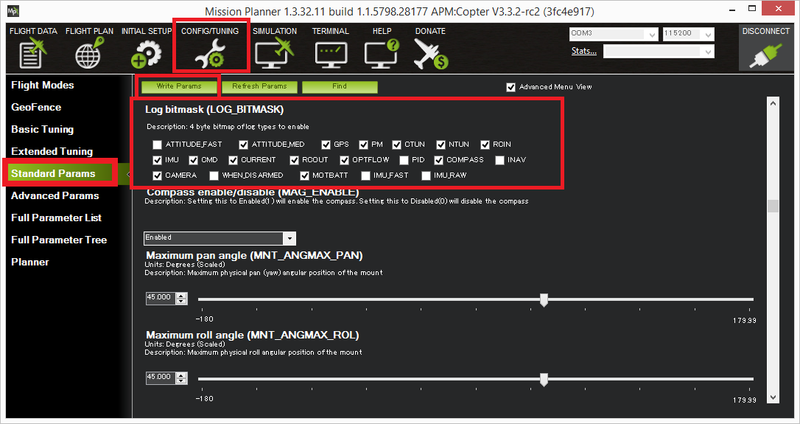 This will save that log to your MissionPlanner/logs directory, in a folder named after the vehicle type, such as QUADCOPTER. For more detailed analysis, click on “Review a Log” and select a log that you’ve already saved to the MissionPlanner/logs directory. Once again, they will be in folders named after the vehicle type, such as QUADCOPTER or ROVER. Select the “Review a Log” button. A standard Windows “select a file” box will let you go find the .bin file that you downloaded, at the place that you downloaded it. (Per the example above, it is in C:\Downloads) Choose that file. 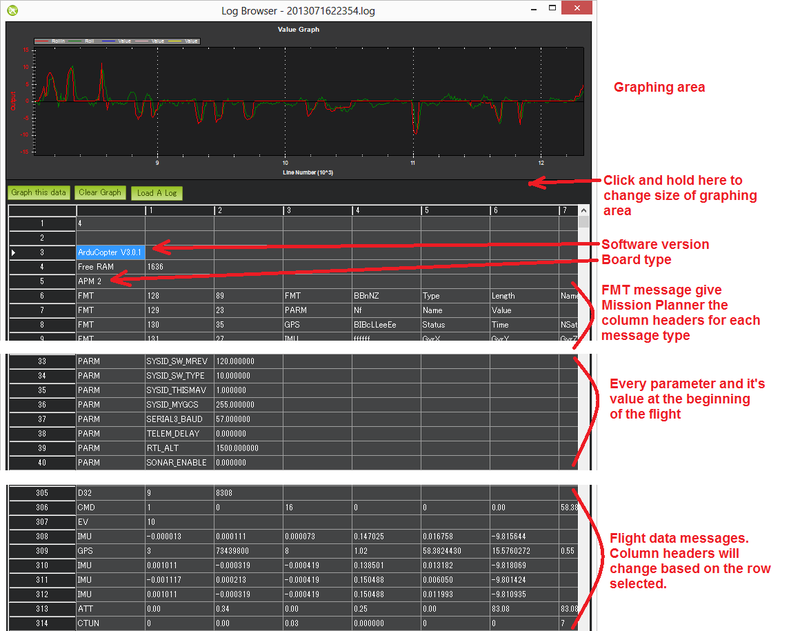 Flight data messages including GPS, IMU, etc. Graph any flight data by first clicking on the appropriate row, you should see the column headers update appropriately. Next find the column you wish to graph, click on it and then push the “Graph this data” button. In the example above the ATT’s Roll-In and Roll data have been graphed. The mouse’s scroll wheel can be used to zoom in or out. You may also select an area of the graph to zoom in on it. Zoom out by right-mouse-button clicking and selecting “Set Scale to Default”. Here’s a mini tutorial on using this feature. You may also filter on just the first column (the flight data message type) by clicking on the first column and selecting the message type from the drop-down. This is very useful especially for viewing the different flight modes (called “MODE” messages) used during the mission. Click the first column again but press “Cancel” to clear the filter. ThO Final throttle output sent to the motors (from 0 ~ 1000). Normally equal to ThrI+ABst while in stabilize mode. DAlt The Desired Altitude while in AltHold, Loiter, RTL or Auto flight modes. It is influenced by EKF origin, which in 3.5.X is corrected by GPS altitude. This is behaviour is turned off in 3.6.X and can be turned on with EKF_OGN_HGT_MASK. Log information here (Dev Wiki). Overview here. SMS The autopilot time in milliseconds that the accuracy/GPS position data is associated with. WPDst Distance to the next waypoint (or loiter target) in cm. Only updated while in Loiter, RTL, Auto. When you download the dataflash log files from the flight controller it will automatically create a KMZ file (file with extension .kmz). This file can be opened with Google Earth (just double click the file) to view your flight in Google Earth. Please see the instructions on the Telemetry Logs Page for additional details.